On 5th February 2017, most of the adults (about 200, editor Enough is Enough) among the 711 refugees residing in a state-run Camp in the former Athens National Airport (Camp Elliniko II), in the majority coming from Afghanistan, started a hunger strike to protest against their degrading living conditions demanding for their transfer to homes, papers and freedom of movement for all. 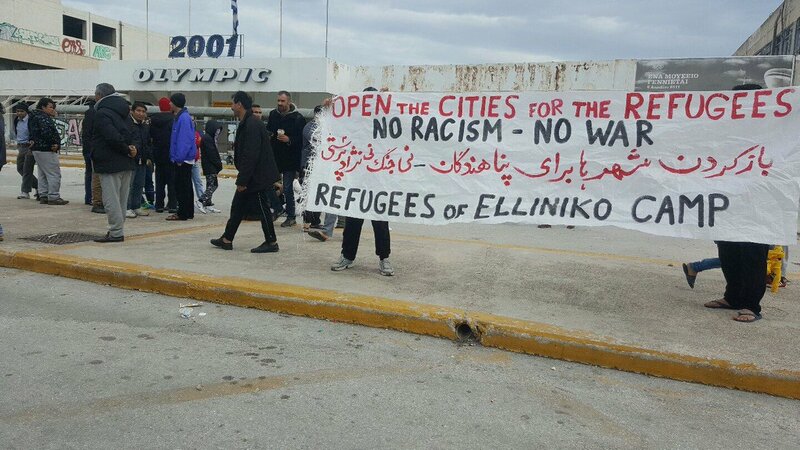 As reported by one of the refugees, it is very likely that residents of the two other camps in Elliniko (the nearby Olympic baseball and a hockey stadiums) might join in the protest today. Image: Earlier today refugees didn’t let Greek migration minister Mouzala into the Ellinko refugee camp but the Migration Minister insisted to enter the camp. After 11 o’clock refugees opened the door. Two kids get slightly injured during the protest, one of which got punched by a police officer. Mouzalas entered without police forces one of the buildings but exited shortly after as refugees were reacting angrily to his presence inside. He had visited the camp last time in July 2016! Refugees used to live in the former airport throughout 2016 for months suffering under overcrowdedness, filthy insufficient toilettes and showers, inadequate food and without any information or legal aid. While the population has been reduced visible, the camp still is inadequate to host refugees and living conditions remain poor. Many highly vulnerable people still stay there. There are elderly, pregnant women, single mothers, people with mental health problems, people with chronic and heavy diseases etc. In the meantime, many refugees are living there since one year. Amongst others, refugees who started the protest complained about the quality of the food, lack of basic needs as for example milk and diapers for babies and toddlers, no hot water, no laundry, lack of translators for sick persons who have to go to hospital and no coverage of their transportation there. It is matter of survival, they state. They do not care about having more clothes or more food. But: food which doesnt’ make sick. Enough food, in order not to be hungry. Heating in order not to freeze. Refugees living in Elliniko are suffering also mentally from the living conditions in the camp and their insecure situation in Greece and Europe. Amongst the refugee population in the camp are women with their kids awaiting their transfer to another European state where their husbands are. There are small kids with Asthma, like this 4-year-old girl who has to go to hospital almost every single night. People lock the doors to protect the salon from the cold, so no fresh air can enter. Many people smoke inside, others cook. The sewage water from the toilettes smells. So many get problems to breath. There is also a young man who had so severe psychological problems, that he had to be transferred into the psychiatric clinic for a month. He was paranoid, thinking at any point someone wanted to kill him. He is taking medicaments now, but he is back in the camp, staying among 700 persons with his family. There is this pregnant lady in her 6th month, who often gets pains and has to visit the hospital again and again. She still lives there. Another woman just gave birth in there one month before. She is also still there. Now, the refugees are trying to rase their voices to the world. They are already self-organised, having elected five representatives and holding plenaries since months. Now they want to provoke change, as they cannot suffer any longer. – Open homes! Open the cities! Immediate evacuation of all into dignified living conditions! – Give papers and residence to stay to all refugees and allow anyone who wants to move to another country to relocate legally and to join their relatives! No discrimination of certain nationalities! – Stop deportations to Turkey! Stop deportations to Greece! Stop deportations to Afghanistan! Stop deportations to any unsafe countries! The right to life for all! Minister of Migration Mouzalas not allowed to enter Camp as refugees locked door and continue protest. Migration Minister insisted to enter the building. After 11 o’clock refugees open the door. Two kids get slightly injured during the protest, one of which got punched by a police officer. Mouzalas entered without police forces one of the buildings but exited shortly after as refugees were reacting angrily to his presence inside. He had visited the camp last time in July 2016!